Today we have an interview with hot selling author ...Rose Pressey! At the end of the interview is a book trailer and a GIVEAWAY! Rose has written How to Date a Werewolf (Rylie Cruz, Book 1), Me and My Ghoulfriends (Larue Donavan, Book 1), No Shoes, No Shirt, No Spells (Mystic Cafe Series, Book 1), Rock 'n' Roll is Undead (Veronica Mason, Book 1) and My Haunted Family: Engrossing tales of one family's encounters with the unknown. Who was/is the biggest influence on you as a child and as an adult? As a child, and as an adult, my mother was the biggest influence. She's a wonderful woman. Who do you like to read? Any favorite book or authors? I love reading paranormal romance/urban fantasy with humor. Authors like H.P. Mallory, Molly Harper, Dakota Cassidy, Nicole Peeler, or Linda Wisdom. If you could write a book with any other author, living or dead, who would you choose and why? Oh, that's a tough question. I'd say Margaret Mitchell because I love Gone With the Wind. Do you have a certain place and time you like to write or are you more the write whenever, wherever the mood strikes type of writer? I write after I eat. Ha-ha. I focus better when I have a full stomach. I eat about five small meals a day, so if I can, I write after I finish eating. Sometimes, it's not an option, but I'm more creative when I'm not hungry. I write in different locations. My dining room table, the bed, the patio, etc. I move around a lot. When you need inspiration to write where do you usually find it? I sometimes go to the park. My books feature spooky locations, so sometimes I'll visit those places. Abandoned homes, graveyards, etc. How do you choose locations for your books? I like writing about my home state of Kentucky, or other cities that I've visited and enjoyed. I love the South. If you could go anywhere in the world to write your next book where would you choose and why? Probably the beach. I'd love to sit and watch the waves. I enjoy decorating my home on a thrift store budget. Yard sales, and flea markets. Spending time with my family, and playing with my Chihuahua. Listening to music, and definitely reading. You have to spend six months in seclusion. The only contact during this time is radio welfare checks twice a day. Shelter, basic food, drink and limited electricity are provided. What are the first 5 things do you choose to take with you? That's a tough question. Would I ever be rescued? I'd say pen and paper, but if I'm there for very long, it would run out. With limited electricity, I guess my laptop wouldn't be a good idea. Definitely a few of my favorite books, like Gone With the Wind, Little Women, and A Summer Place. A hairbrush because I can't stand tangled hair. My toothbrush and toothpaste. Could my purse stuffed with everything including the kitchen sink count as one item? Please tell us why you think we should read your books. My books are a nice escape for a few hours from the boring stuff, like cleaning house, work, etc. There's only so much tedious stuff I can handle before I need a break, and I love reading books when I get the chance. Please tell us about upcoming projects. I have follow-ups for all of my series coming out over the next months and next year. Plus, I'm working on a new series, but it's super secret. Thanks for having me on your blog, Cristina! Thank you for stopping by Rose! It was a pleasure having you. Here is the video trailer of ROCK 'n' ROLL IS UNDEAD. This is Book 1 of the hot new Veronica Mason series from Rose. I read it and it is awesome! 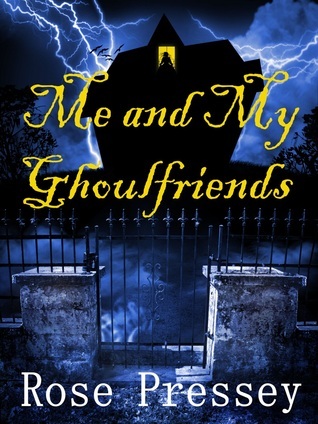 Rose has offered an e-copy of Me and My Ghoulfriends for our Summer Giveaway Hop . Just in time to read it before Book 2 - Ghouls Night Out comes out at the end of August! How cool is that? Please remember that e-copies can be read on many devices,(with apps), including the PC if you do not own a e reader. Please see the Giveaway Page located at the top of this page for information on how to enter. Thank you and good luck! Enjoyed this fun interview. I've never read Gone With The Wind but have seen the movie a few times. In fact, my post for this Friday (8/5) will be on this topic. Thank you for stopping by and commenting. Gone With the Wind is an excellent book. I will be sure to check out your post this Friday!